In 2013, the Royal Warrant was awarded to KHIPU following our delivery and support of services for over five years to the Royal Household. 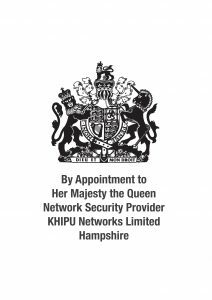 KHIPU are the only warrant holder to be awarded as a “Network Security Provider” to Her Majesty The Queen. On 28th March 2019, we successfully again renewed our warrant for a further three years as a result of providing over 11 years of outstanding services to the Royal Household. This is a huge achievement for KHIPU, as not only does it provide recognition to our staff for their hard work, it reconfirms that we can continue to provide exceptional customer services. We would like to thank the Royal Household, the Royal Warrant Holders Association and the KHIPU team for this prestigious appointment. Over the centuries Royal life and tastes changed. Henry VIII appointed Thomas Hewytt to ‘Serve the Court with Swannes and Cranes’ and ‘all kinds of Wildfoule’. The Field of the Cloth of Gold in 1520 was largely put together by Royal Tradesmen. Charles II’s 1684 list of Royal tradesmen included a Sword Cutter, an Operator for the Teeth, and a Goffe-club Maker. Among the tradesmen supplying the Royal Household in 1789 were a pin maker, a mole taker, a card maker and a rat catcher. In the late 18th Century, Royal tradesmen began displaying the Royal Arms on their premises and stationery. But it was Queen Victoria who ensured that Royal Warrants gained the prestige they enjoy today. During her 64 year reign The Queen and her family granted more than 1,000 Royal Warrants, eight times as many as The Queen’s uncle, King George IV. They included companies such as Fortnum & Mason, Schweppes and Twinings, which still hold Royal Warrants today. For further information, please visit the Royal Warrant site.